Store bought produce just doesn’t taste the same as it used to. At first I thought it was my taste buds, but many people I know agree. Do you grow any of your own veggies? Some of my favorite childhood memories are of summers spent in my grandmother’s Irish garden. She grew cabbage, lettuce, carrots, turnips and parsnips. There was a hot house dedicated to grapes and tomatoes, a hen house where fresh eggs were collected daily, and a wild front field where mushrooms sprang up every night. Off I’d go each morning with a basket over my arm to pick fresh mushrooms the size of my hand. Every meal in that house was a feast, and the simpler the ingredients, the better the meal. I’ve never trusted myself as a gardener, believe it or not. Every potted plant I’ve tried to grow has died to reinforce my self-doubt. A few seeds I’ve potted grew for a while and looked promising, only to be fried by the Texas sun, or over-watered to death by me. This year, I’ll try again. I want to taste true flavor in my food. I want to know I can do what my grandmother did so well. I assume you know how to make mashed potatoes. Don’t use an electric mixer. The best mashed potatoes are hand mashed. Peel, cut, boil, drain and steam the potatoes. Use half the butter and half the cream to whip them into a smooth mash, flavoring with salt and pepper. Add chopped scallions. Cover and let steam. At the same time you boil the potatoes, add sliced and diced cabbage to a different saucepan of boiling water, boil for about 8 minutes, and drain. Let half the butter melt over it, and steam with the lid on. Now, blend the potato and cabbage mixtures in one saucepan and mix them well. We ate big bowls of this mixture with a large tablespoon of butter melting in the center. Although it’s not traditional, each bowl was topped with a fried egg. I hope you enjoy this recipe as much as we do. 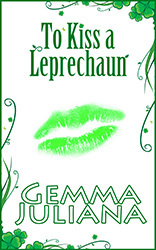 In keeping with my Irish themed recipe, my giveaway for the Authors in Bloom Blog Hop is an ebook copy of To Kiss A Leprechaun. Thanks for visiting! Be sure to LEAVE A COMMENT below, and stop by all the authors on the hop if you want to be eligible for the Grand Prize ereader (your choice of a Kindle or Nook) and a $25 gift card (to the platform of your choice. Second place prize of a $24 gift card. Leave your email address in your comments so we can contact you if you win. Winners will be posted on both the first (Dianne Venetta) and last (A Cozy Reader’s Corner) websites after the hop ends. Have fun! Thanks for participating. Below is the hop list for your convenience. For more info check out the official hop page. This entry was posted in Blog Hops, Event. Bookmark the permalink. I have tried growing veggies and flowers without success. I am, however, very good at growing weeds! Sorry to say I’m a great weed grower as well, Michelle. Have fun on the blog hop! The recipe sounds delicious. I’ve never had eggs on top..gotta try that. It’s a very hearty meal with the added egg. What a fun project for you and your fiance together. I’m sure your house and garden look beautiful with all the flowers. Enjoy the blog hop! Clever, Angela! It’s a great way to get cabbage into kiddies. I’m all for hidden veggies in meals. Thanks for stopping by. I can’t wait to try your recipe! I’m Irish and I’m surprised my mom didn’t have this in her recipe box :), we can’t wait to make it! I can feel your sadness about the poor pumpkin vines all dying. You’ve got the right attitude, though. Never give up. This year may you have a plentiful crop! You’ll enjoy the colcannon. It’s easy, inexpensive and delicious. Thanks for stopping by! Happy hopping! There are so many good recipes on this hop that I’m bound to gain 50 pounds this week! You and me both, Elizabeth! I just have to look at food and I gain weight. Have fun on this wonderful blog hop! That’s a fine tip, Leslie. Dirty nails are one of my pet peeves about gardening, but gloves are too thick. I like hands on, but I also love clean nails. Thanks, enjoy the hop! I love home grown too! I’ve been growing cucumbers for the last few years and there’s such a difference. They last longer in the fridge and no waxy coating! The cabbage recipe sounds delicious. My Irish mother would love it. My husband…not so much. LOL! I’ve noticed how fast cucumbers go off these days, too. I’m planning to grow cucumbers this year for the first time. Thanks for stopping by, Catherine. 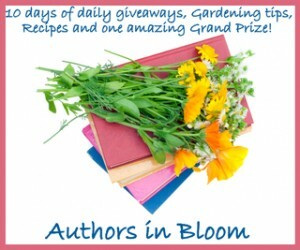 This is a wonderful blog hop, with so many friendly and quality visitors. Thanks for supporting authors by stopping by and joining in the fun, Elise-Maria. Enjoy the hop! I want to read this book. I haven’t started on my garden but it’s finally getting warm. Hi Arlinda, the weather is still flip-flopping so much, it’s good to have some good reads on hand! Thanks for visiting! Hi bn100, nice to see you again! 🙂 Enjoy the hop. I’m not a gardener but I do love fresh, homegrown fruits and vegetables and can’t wait for the new crops to hit the farmer’s markets. Love the sound of your recipe and I think I’ll try it. Thanks for the giveaway too. I’m also a farmer’s market fan. Today it’s particularly cold again and I wonder what crops we’ll have at all this year! Thanks for visiting! Never heard of this recipe, but I love cabbage so this looks delicious. I will have to try. Thanks for participation in hop. Thanks for stopping by, Judy! Hope you are enjoying the blog hop! Take care & I hope you have a great day!! Hope you are enjoying the hop! Thanks for visiting my page. I love cabbage, too, Lisa. Thanks for stopping by! Happy hopping! That sounds really good… Love cabbage and potatoes 🙂 Thank you for being part of the hop. I must agree that our homegrown veggies, fruits and eggs taste so much better than anything you buy from the store. Thanks for being a part of the giveaway hop! Thanks for sharing the colcannon recipe. It sounds delicious. I love home-grown vegetables, especially tomatoes. Thanks for the great giveaway! There is nothing like homegrown food. Great memories of sitting in my grandmother’s garden. I love sun-warmed tomatoes. Thanks for sharing the recipe. PUMPKINS, GHOSTS & WITCHES, OH MY!